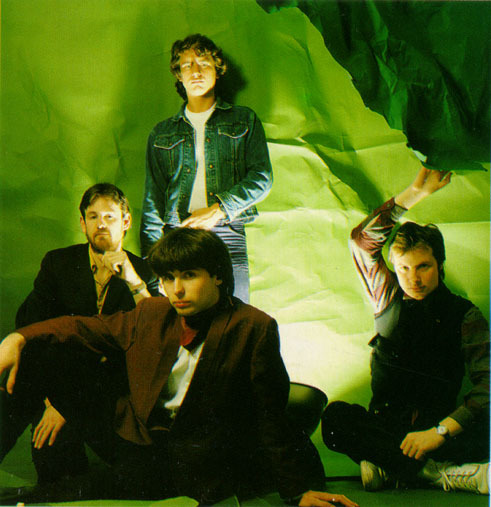 Original/Current [sic] line-up: Andy Partridge, guitar, vocals; Colin Moulding, bass, vocals; Barry Andrews, keyboards; Terry Chambers, drums. Career: Partridge organised XTC as punk band in Swindon, near London. "This is Pop?" single attracted some attention and revealed XTC to be power-pop group in punk clothing. This became more apparent by time solid third album, "Drums and Wires", appeared in 1979. Next LP yielded minor hit, "Sergeant Rock" [sic], which earned some U.S. airplay and write-off as lightweight by UK press. In 1982 "Senses Working Overtime" put band back in UK charts, and double LP "English Settlement" (cut to single LP for UK market) received critical approval. End of 1982 produced singles compilation (UK only) "Waxworks". In promotional move, this album was issued for limited time with second LP, "Beeswax", comprising B-sides. After illness hit leader Partridge, band gave up heavy touring schedule while continuing to record. Subsequent albums were well received by critics (particularly Todd Rundgren-produced 1986 offering "Skylarking"), but major commercial breakthrough continues to elude band.